Irrespective of what you want to use your speakers for, there are a few mandatory facts you need to know before you decide to choose the right outdoor speakers for your home. Additionally, choosing outdoor speakers is not a complex science. This article is going to take you through a comprehensive coverage on how to choose the best outdoor speakers that will bolster and spice up your entertainment life. Before you choose the right outdoor speakers, you need to decide what you will do with the speakers and where you are going to use them. When you determine the environment in which you will use the speakers, you will be better placed to determine the other features of the speakers you will settle for example their construction material. This factor will also influence other performance, and technical characteristics of the speaker such as the level of bass the speakers will need to have. Another factor that will also influence your approach on how to choose the best outdoor speakers is whether they are corded or cordless. You will need to decide whether you will go for cabled or wireless speakers that will allow you to enjoy the benefits of hassle-free installation. Corded speakers will also have the advantage of allowing you to enjoy a better sound quality that is free from the interference that may arise from the limitations of wireless connectivity. Another factor that you will need to consider before settling for a particular outdoor speaker is the type of material used in its construction. This consideration is vital because you will use these speakers in an environment that is subject to different hostile weather elements such as frost, hail, wind, rain, dust, and heat. When you consider all these issues, you have to select outdoor speakers that have an all weatherproof construction to withstand all these harsh elements and serve you better and longer. You will also have to factor in the type of connection the speakers come with. Connectivity type is vital since it will determine the most suitable place and the kind of input you will connect the speakers too. For instance, speakers that have an auxiliary connectivity will be suitable for connecting the speakers to diverse appliances such as MP3 or CD players. On the other hand, speakers with home theater connectivity are ideal for connecting to a home theater. Another key factor that will guide you on how to choose the best outdoor speaker is the genre of music you will be listening to. If you are deep into bass-concentrated music such as Rock and R&B, you need a sound system that is more booming than if you will be playing Jazz and Instrumentals. You need to factor in the design of the speakers you need to buy. Outdoor speakers come in all forms of designs and shapes hence you can choose based on your esthetic preferences. To conclude our guide on how to choose the best outdoor speakers, we come to budget matters. Set a budget that will give you decent quality and value for money without sinking into debt and avoidable financial issues. The process of selecting the best outdoor speakers for your home should never be a cause of alarm. All you need is to get the right nuggets of insight and wisdom to carry you through the process smartly. 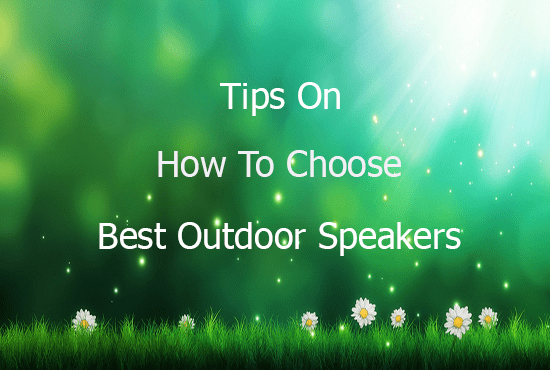 This guide attempts to furnish you with all the wisdom you need on how to choose the best outdoor speakers for your home. All you need to do is to apply these facts as they are, and you will be another step ahead in enhancing the entertainment atmosphere of your home. Best Wireless Outdoor Speakers 2019 – Buyer’s Guide How to install In-Wall Speakers – Step by Step Tips How to Install Outdoor Speakers Step By Step Guide Why Choose Bluetooth Speakers?